Welcome to our new website; its launch just about coincides with the move into our new location at 435 Foxon Road in North Branford. Our growth as a company and the changes in our business are reflected in both our new offices – larger, custom-crafted and well-suited to our evolving business – as well as new website, which tells the story of our ever-evolving construction trades, general contracting and real estate development operations. Our new home is situated on a 1.25 acre lot in Total Interiors’ hometown of North Branford. The building is historic; a 3,200 square foot colonial originally erected in 1775. 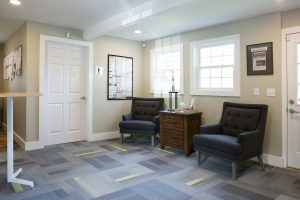 We kept all the original walls and flooring; as such, it definitely has a different feel than the offices of most modern construction companies you’ll visit. To us – however, it feels exactly like home. We’ve added some touches to make it truly our own space, including a music studio/recording space and a great patio and grilling space where you might find some of us after work this summer. But we’ve also modified the space to service our clients, employees and to facilitate the types of projects with which we are involved these days. There are stand-up computer stations in the entry-area so our project managers and field supervisors have a place to work when they are not on site. Our meeting rooms are spacious and well-lit, perfect for reviewing building plans or discussing construction financing. And we have a few outside areas on our lot that are perfect gathering spots to conduct the type of blue-sky thinking our customers have come to expect from us. All the while we’ve been building our new home, we’ve also been developing our new website. It’s a great place to see some of the work we’ve recently completed, such as Atlantic Station in Stamford, CT, 66 High Street in Guilford, CT or the Yale Art Gallery and Continuum Services Center in New Haven, CT. 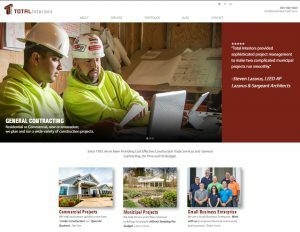 The new website is the place to browse our company information, our approach to new construction & renovation work, and our deep expertise in commercial construction, residential construction, municipal projects and institutional construction showcased in the Project Galleries section. As you can see, we are growing the size and scope of our business. If you have a project, please contact us today.